The mole ogre howled out as it collapsed into a bloody pile of rent flesh and broken bone. The aging knight bent over, panting heavily, and gave his dwarven peer an approving nod. It had taken great effort between them both to slay the beast, and they had each take their share of wounds. But in the end their cooperation had paid off and they both knew it. And then their eyes found the treasure chest sitting in the corner of the room. Dungeon Run is an exciting dash through a dungeon packed with monsters and traps. Each player controls a unique hero capable of great feats, and whose powers and abilities are upgradable and customizable throughout the game. Players can work together to overcome the perils of the dungeon, or they can betray and sabotage each other as they see fit. Because in the final room of the dungeon lurks a powerful boss with the ultimate treasure - a treasure that turns its owner into the most powerful warrior they can become! Slay the boss, steal the treasure, and then run for your life as your friends try to cut you down. In Dungeon Run only one hero can escape with the fabled Summoning Stone. Don´t walk - run! For 2011 Dungeon Run was the game I was most excited to get. After playing a few games it was very apparent to our group that some more content would kick this game up a notch. Don’t let this get you down though, this game is very good. It will take a few times through to get the rules down, but once you do this 45 min dungeon crawl will have you and your friends howling at each other. The solitaire mode is also pretty fun if you have some time to kill and want to see how good of a solo adventurer you are. To begin the game you pick a hero as well as some matching skills to go with them and your off. Each new tile explored offers you a different challenge to complete, wither its an tundra orc or an acid pit. Each encounter that you beat gives you experience which you can turn in and level your character up. The name of the game is to get to the end of the dungeon and defeat the boss which is very hard to do solo so make sure you didn’t stab all your friends in the back at this point. Once the boss is beaten the player who dealt the deathblow is given the summoners orb. The first player to escape the dungeon with the orb is the winner! Overall its a very good game, but it does need some expansions. However the game is very easily expendable with additional dungeon tiles, bosses (the original game comes with 4! ), characters and items. Plaid Hat has even mentioned that they have begun work on expansions already. If you want a fast paced competitive dungeon crawl than Dungeon Run will fit the bill. Your goal is to reach the boss room of the dungeon, slay the overlord, and retrieve the powerful artifact called a Summoning Stone. The player in possession of it becomes a summoner with new abilities, and the must either reach the entrance of the dungeon or kill the other players. One of my favorite aspects of this game is its connection to Summoner Wars, an important part of the lore of that game being summoning stones. It almost makes this game feel sort of like a prequel to that one (it would be really neat if they made characters from Dungeon Run into Summoners for SW). The game itself is very fun as well. You can work together with the other players, and then back-stab them when they least expect it. I really enjoy games that allow you to manipulate others and form tenuous alliances. One great aspect is the re-playability. The dungeon is always randomly generated. There are 8 characters, each with a unique deck of 10 skill cards, only 5 of which you will be able to use in a game. This along with a fairly large deck of encounters full of monsters, traps, and strangers (NPCS), and a treasure deck as well. Its also very quick, around an hour to play, but the game is fun enough to try to fit in more than one game a session. Creative design for a game. I did have fun. High replay value for obvious reasons. Only have played once so still not sure what optimal strategy would be. Only complaint is that after one player defeated the boss, things became complicated and technical. Is he still a hero, or the boss, or both? We had tricky situations arise from this point on. I believe one question/situation we had wasn’t even in the instruction book. Interpretation of instructions at the end basically decided the winner. If no one else mentions this issue, I apologize, we could have just been ********. I have only played it once but it was enjoyable enough to want to do it again. Thankfully I had an experience player who took us through the rules and game play. Pretty cool game. Minis should have been painted but were not… so I painted them for the owner. 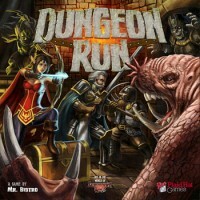 Add a Review for "Dungeon Run"